What Are the Different User Roles Available for My KCM GRC Platform? The KCM governance, risk, and compliance platform (KCM GRC) offers a role-based access control (RBAC) model for the various user accounts needed by your organization in order to implement, manage, and carry out workflows in your account. With this RBAC model, users can complete the job functions required of their role without having access to privileged, or unnecessary information. You can grant multiple user roles to one individual, allowing users to work across the different modules available for your account. See the table below for a description of each user role, and an outline of the associated privileges. Account Administrators have full access to all areas, scopes, and modules within KCM GRC. For example, they can create and disable user accounts, convert templates to scopes, and see an overview of key items in your account. As an Account Administrator, you're presented with a Global Dashboard which provides an overview of your organization's current state of compliance, and other information pertaining to the entire Compliance Management Module. Add/Remove mappings between scope requirements and controls. 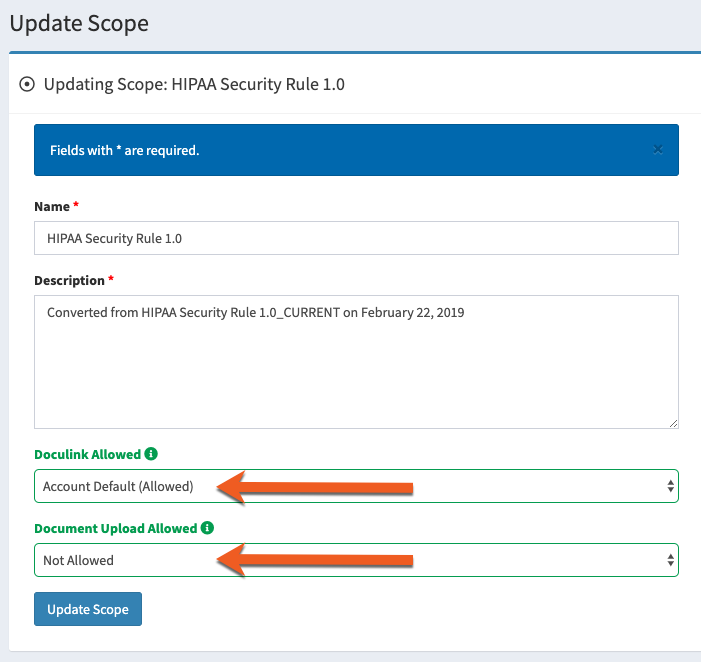 Scope Administrators work in the Compliance Management Module and are granted permissions on a per-scope basis. They have access to all data within their allowed scope(s), including requirements, controls, tasks, and evidence. For more information on Scope Admin permissions, see our Working with Users article. User Responsible: Assigned to tasks in order to provide evidence or documentation that the organization is in compliance with the control. The User Responsible receives reminder emails based on the due dates of upcoming tasks (see: What is the task reminder email schedule?). The User Responsible typically has a Contributor user role (see below for more information). Approving Manager: Once the User Responsible has submitted evidence for a control task, the approving manager will determine if the evidence is sufficient, accurate, and complete. If the evidence is approved, the task will be closed, if deemed insufficient, Approving Managers can add task notes to inform the User Responsible of what is still needed. See: How Do I Approve Tasks? View the Global Dashboard–providing an overview of your organization's current state of compliance, and other information pertaining to the entire Compliance Management Module. View My Dashboard–containing data pertaining to the tasks they're assigned to as the User Responsible or Approving Manager. View modules other than the Compliance Management module. User Experience: Click here to view the KCM GRC navigation panel access for Scope Administrators. The Contributor user role has "mid-level" permissions in the Compliance Management module. Contributor users can access more than an Auditor, and less than a Scope Administrator. Contributors complete the tasks that are assigned to them by the Scope Administrator or Account Administrator. They can be assigned to tasks as either the User Responsible or Approving Manager. If the Contributor is assigned a task as the User Responsible (see, above): They can review controls, control documents, control notes, and task notes to determine what is required of them in order to satisfy the control. They will upload files or link to evidence that supports the control task. If the Contributor is assigned a task as the Approving Manager (see, above): They will review evidence submitted by the User Responsible and close the task once it is satisfied. 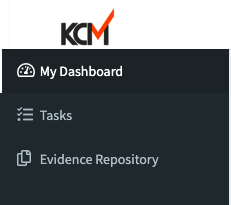 User Experience: Click here to view the KCM GRC navigation panel access for Contributors. Auditor accounts are used to give a reviewer, assessor, consultant, board member, or auditor limited access to the Compliance Management and/or Policy Management modules in your account. Auditors are granted access on a per-scope and per-policy campaign basis. An Auditor can only see limited data and reports for the scopes and/or policy campaigns they're granted access to. For more information about granting Auditor permissions, see our Working with Users article. View Policy Management Reports under the Metrics page (and from Policy Management > Reports). User Experience: Click here to view the KCM GRC navigation panel access for Auditors. Policy Administrator Policy Administrators have full access to all objects (i.e., campaigns, groups, users, policies, etc.) within the Policy Management module. Policy Administrators can add end users, create user groups, and create and manage all policy campaigns. For more information, see our Policy Management article. 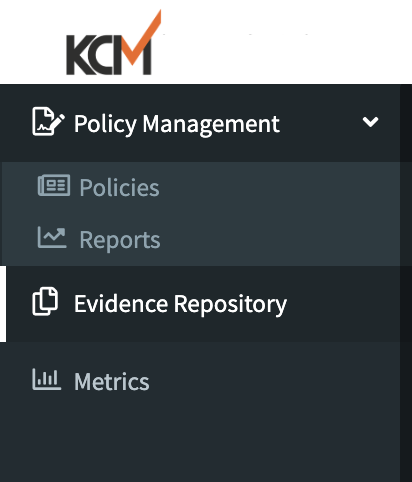 User Experience: Click here to view the KCM GRC navigation panel access for Policy Administrators. Campaign Administrators are granted access on a per-policy campaign basis. They have access to all data within their allowed campaigns. They can add and manage end users, monitor campaign progress, and nudge users who have not yet acknowledged policies. 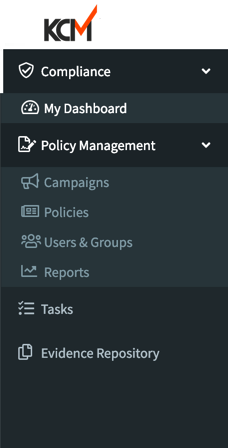 If you want to limit access to some policy campaigns but not all, assign the Campaign Administrator user role. User Experience: Click here to view the KCM GRC navigation panel access for Campaign Administrators. End Users are added to KCM GRC only for the purpose of receiving policies by email, as part of policy campaigns. Using the link from the recipient's email, the users read and acknowledge your organization's policies. Policy acknowledgments are recorded in KCM GRC, within the associated policy campaign. Risk Administrator Risk Administrators have full access to all areas (i.e., Risk Templates, Risk Register, Risk Wizard, etc.) and items within the Risk Management module. For more information, see our Risk Management: Overview article. Use the Risk Register to import/export, modify, archive, and add new risks. User Experience: Click here to view the KCM GRC navigation panel access for Risk Administrators. For additional information on the user roles, our User Role Use Cases may help you determine which roles are the best fit for your organization's objectives in your GRC platform. If you'd like instructions for adding new users to your platform, please see the Creating New Users section of our Working with Users article.